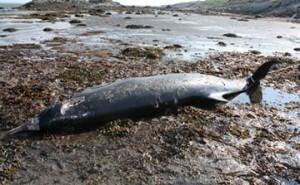 In early July, the carcass of a recently dead male Sowerby’s beaked whale (Mesoplodon bidens) was found stranded on l’Île aux pommes in the St. Lawrence estuary (Québec). According to its body length and the level of dental development, the whale was believed to be a young adult. A team from the CCWCH Québec Regional Centre conducted a full necropsy of this animal on-site. No significant anomaly was found during the gross examination of the carcass. 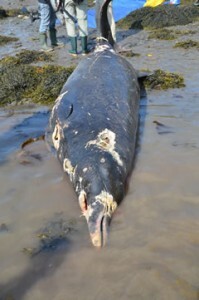 The microscopic examination of the tissues collected during this investigation enabled us to rule out infectious diseases as a potential cause of death, leaving the cause of the stranding unclear. As with other species of beaked whale, Sowerby’s beaked whale occur almost exclusively in deep waters off the continental shelf edge; sightings of this species in costal water are very unusual. The absence of disease, the good body condition of the animal and the presence of fish remains (otoliths) in its stomach suggest that this whale was in good health prior to its “acute” stranding. Consequently, we can make the hypothesis that this stranding was a result of the incapacity of this strictly pelagic species to navigate in an unfamiliar “costal seascape” characterized by shores, sandy slopes, islands and tidal movements. The reason why this whale decided to travel out of its usual geographic range into the St. Lawrence estuary remains unclear. The presence of fish remains in its stomach suggests that it might have followed prey. Interestingly, another Sowerby’s beaked whale was found stranded last June in the St. Lawrence Gulf on the north shore of Prince Edward Island (see previous article from July 24, 2013). This double occurrence of a rare event could suggest a change in the geographical distribution of the prey of this species, which might be associated with global changes in this ecosystem. Despite the fact that Sowerby’s beaked whale is one of the most commonly seen beaked whales in its range, very little is known about its population biology. There is no information on global abundance for this species; it is considered as potentially vulnerable to low-level threat by the IUCN.